When you are suffering from Sleep Apnoea, it is important to use CPAP (Continuous Positive Airway Pressure) to ensure that you get a restful night's sleep. However, some CPAP masks can be uncomfortable and can actually hinder the quality of your sleep. 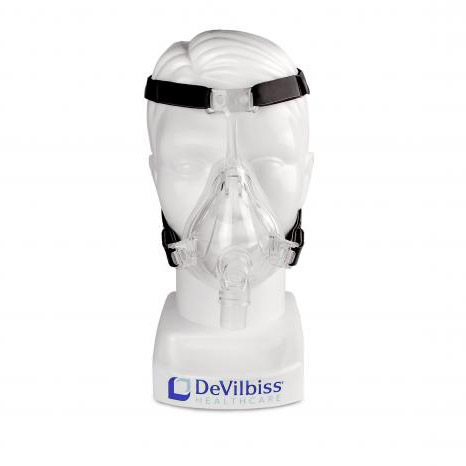 The DeVilbiss D150 Full Face CPAP Mask has been designed to eliminate this problem, giving you a comfortable mask that is also cost effective. To ensure that you are getting the highest level of comfort, the D150 CPAP Mask includes a silicone cushion that ensures that the mask is as comfortable to wear as possible. The silicone pads are available in 3 different sizes (Small, Medium and Large), which provides you with a mask that is better suited to your needs. The D150 includes an adjustable forehead support that allows users to adjust the mask to fit their individual facial profile. This reduces the need for separate forehead rests, meaning that you have to buy fewer additional pads to ensure comfort. The headgear is also adjustable and includes clips that allow for easy removal of the mask, making the product ideal for people that need care. DeVilbiss understands that not everyone sleeps in the same position and to help account for this, the D150 Full Face Mask includes a tubing attachment that can be rotated 360°. This prevents the tube from becoming obstructed no matter how you like to sleep. It is recommended that you clean the mask after every use to ensure longevity. Cleaning can be done by detaching the headgear and cleaning components with warm water using a mild detergent. All components should be thoroughly rinsed and left to air dry. The D150 CPAP Mask can also be cleaned in the top rack of a dishwasher. Please be aware that the D150 mask is designed for single patient use only. If you notice excessive discolouration, cracks or tears in the mask, please replace immediately.